The 14th Annual Renaissance Festival Awards results are in! After months of going through and tallying over 8,000 votes, the awards committee finally posted the results on March 1st, a whole month after they were originally supposed to be posted because of the amount of votes that had to be accounted for. Voting began on the 1st of January and ended on the 31st of January. For 14 years, the Renaissance Festival Awards have been sponsored by the Renaissance Magazineand the Renaissance Festival Podcast, who have supported artisans, performers, and festivals who bring joy to fans everywhere. The nominations for the 15th Annual Awards will be coming soon, so make sure to keep checking their Facebook pagefor more information. Forty-two categories featuring big and small ren fairs, performers, vendors, and craftsmen, among others were brought forth to voters. All of the categories included nominees from around the US who bring the magic of the faire to life. “We are honored to win for a second year in a row, and are grateful to be recognized for our laundry labors of love. 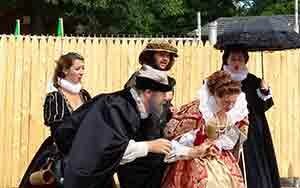 All 30+ cousins from our 20+ shires want to thank each of you from the bottom of our filthy hearts,” The Washing Well Wenches, winner of the ‘Comedy Performers’ category, said in a post on the Renaissance Festival Awards’ Facebook page. The Washing Well Wenches is the largest and longest-running female-fronted comedy show performing nationwide on the renaissance festival circuit. For over 30 years, this group of women have been entertaining thousands of festivals in the US and Canada. The Wenches act, sing, and play instruments for viewers while adding a funny twist to their performances. Another winner, the Connecticut Renaissance Faire, won the New England Renaissance Fair category for the second year in a row. “We’re thrilled. There’s a lot of great fairs around here, including King Richard’s, so for us to beat them is quite an achievement,” Brian Harvard, General Manager of the Connecticut Renaissance Faire, said. Since 1999, the Connecticut Renaissance Faire has been taking people back to the past with their fantasy entertainment shows, vendors, food, and drinks. They celebrated their 20th anniversary in the fall of 2018 and invite people of all ages to join them in their 21st season from August 31st to October 14th. Daniel Kostelec, who does a one man Shakespeare improv show called Shakespeare Approves, won first place for Favorite Child-Friendly Act. Through an audience interactive live show, Dan plays the roll of Shakespeare for famous plays such as Romeo and Juliet, Macbeth, and Titus Andronicus and uses audience members to come up on stage and play out scenes.